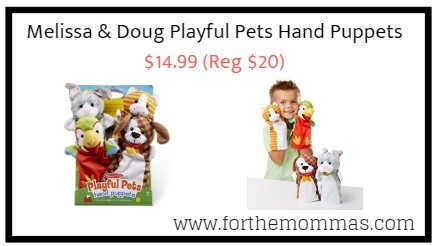 Amazon has Melissa & Doug Playful Pets Hand Puppets for $14.99 (Reg $20) with FREE Shipping on orders over $25.00 or with Amazon Prime Orders. This four-piece hand puppet set makes it easy for young kids two and up to role play alone or together with adults or other kids! Although made for little hands, these puppets are also sized to fit on most adults. The rabbit, parrot, kitten, and puppy are soft, simple, and friendly glove puppets which can be used together to act out a scene or separately for simple puppet play.